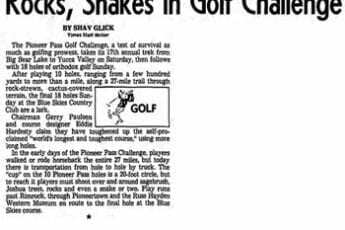 YUCCA VALLEY – The third annual Pioneer Pass Golf challenge is scheduled for Oct. 7-8 according to Al Fisher, chairman of the PPGC. 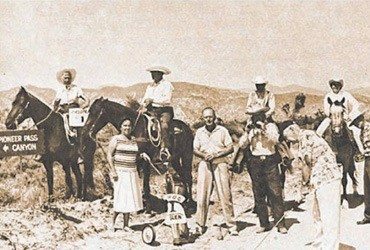 The Challenge has been set up in an effort to further interest in the development and improvement of the Pioneer Pass road between Pioneertown and Big Bear Lake. The “back country” road that is now traveled by sturdy jeeps, has been improved by the county and forestry Service in the past few years, but still lacks accommodations for modern day automobiles. The actual gold tournament is played on two courses. Nine holes at the Yucca Valley Country Club and nine holes at the Moonridge Golf Course at Big Bear. The 19th hole has a Fairway 9 1-3 miles long. 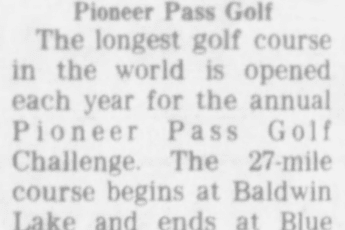 It is the Pioneer Pass road and the golfers “play’* this distance with each contestant equipped with a ball spotter and score keeper. Nine intermediate slops or “check points” are located along the route where the golfers are checked in end information passed on in regards to weather, road conditions and scores. The information is transmuted by radio from one spot to another. Fisher pointed out that the past two Pioneer Pass Golf’ Challenges have been outstanding successes and with the entry lists growing day by day, this year’s affair appears to be shaping up to be another top flight golf challenge.